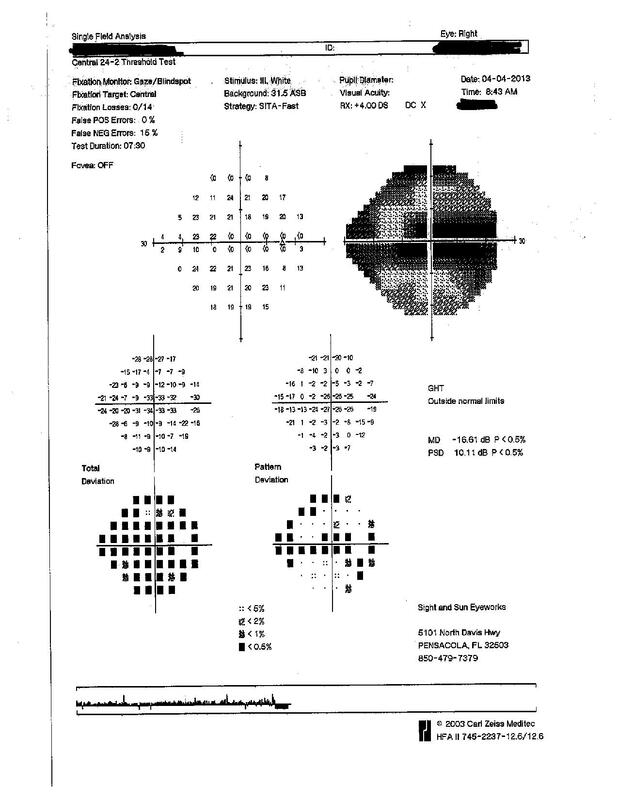 Heres is how visual fields are assessed in the optometry office. 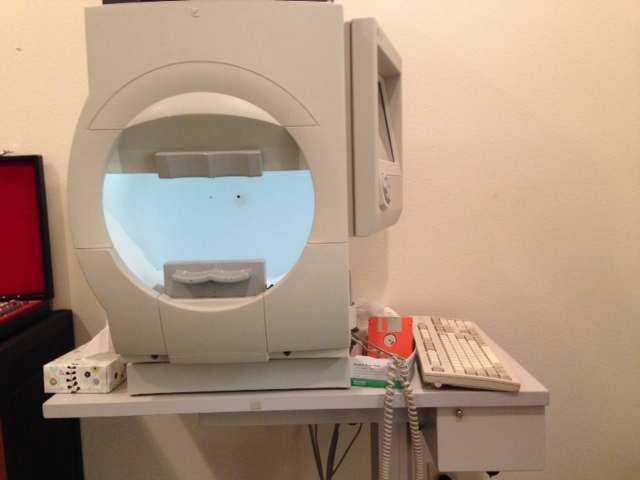 This is Humphery visual field tester. The test is generally done monocularly first. The patient places their face on the chin rest and clicks a switch when they see a light in the field. The device monitors fixation during the test and lets the tester know if the patient “cheated” by moving their eyes. Binocular testing may be done separately if needed. 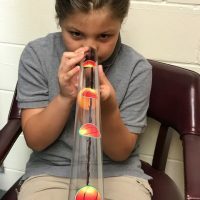 During this, the patient is allowed to move their eyes. The results are very precise with even small peripheral reductions in field picked up. But there are some limitations. The patient must be able to respond in a timely manner by clicking a button, so motor response time and even posture can affect the ability to perform testing on this device. 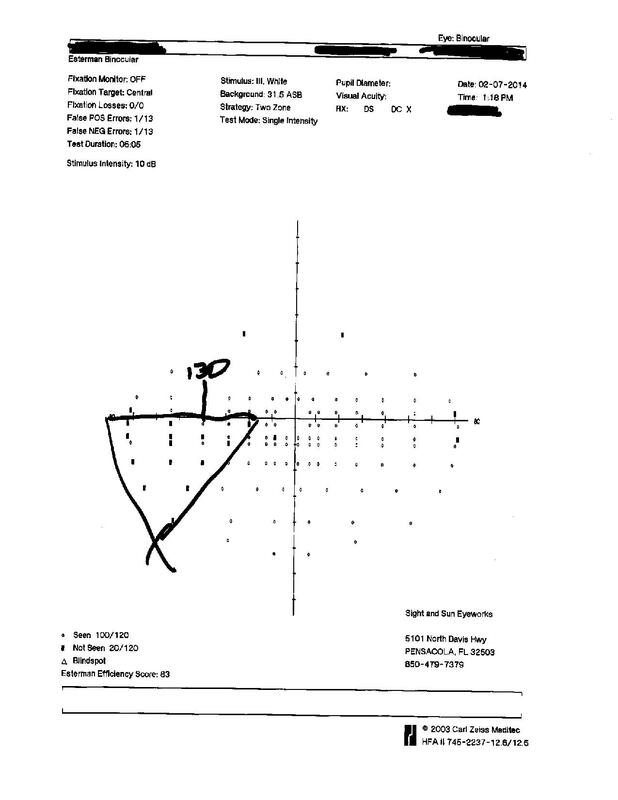 Visual field testing by confrontation is a way to perform visual field testing in clinic without the computerized tester. In the test, the therapist sits in front of the patient presenting fingers in each field with patient reporting the number of fingers up. This is done for each eye. It is important to present stimulus in all four quadrants of the visual field. 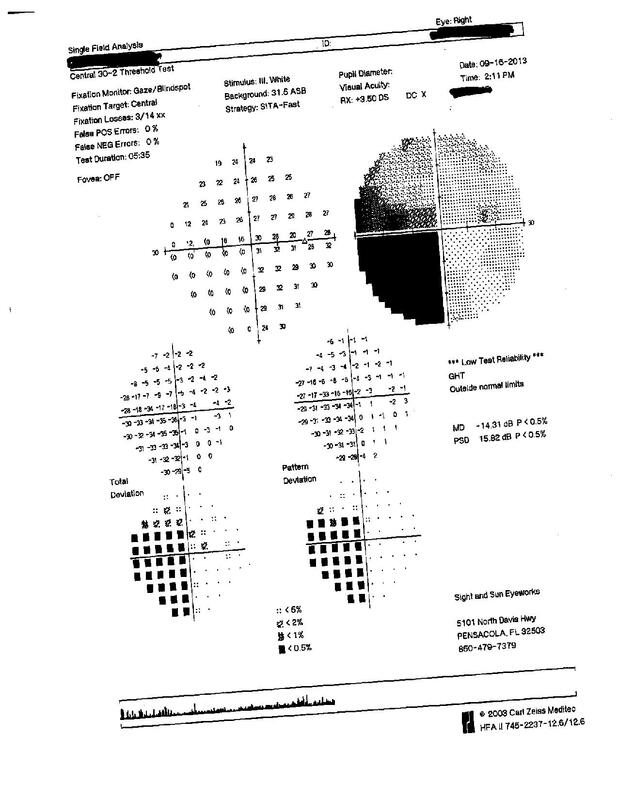 Results of this can be correlated with other visual cancellation tests. There is also campimetry which uses a specialized disk with different fixation points. 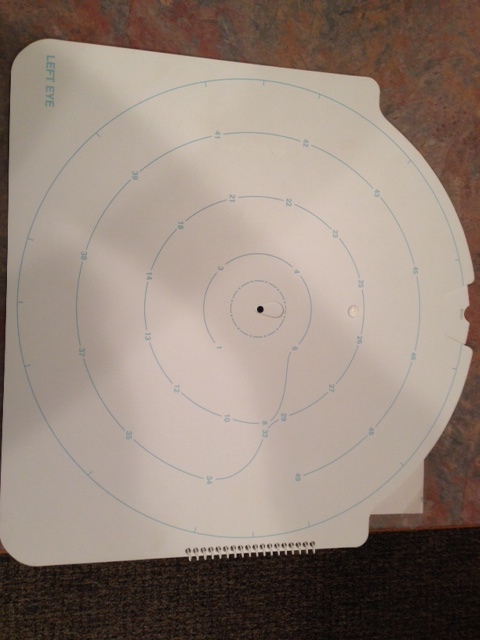 With the campimetry device shown above, the patient fixates on numbers on the disk and reports if they can see the middle spot. 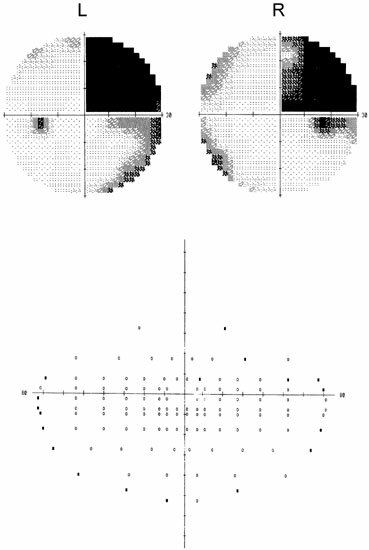 There is also a web-based Damato Multifixation Campimeter test for visual fields that is free. Homonymous hemianopia is the most common visual field loss following a neurological event. This is lose of half of the visual field in each eye . These can affect right or left visual field (generally contralateral to the affected side of the brain, left brain right field cut). These tend to be associated with tempro-parieital lobe or occipital lobe damage. Left side field cuts tend to have a neglect aspect associated with them. The patient may not even be aware of the left sided vision loss making treatment of the field cut more difficult. Right sided field cuts tend to be more occipital lobe related with the patient showing improved awareness of the loss and improved recovery. Here is what it would like using a Goldman 30-2 test. This test looks at each eye separately and requires fixation. The similar patterns in each eye tells us this a visual pathway problem, not and orbit problems. Here is what it looks like on the Easterman Binocular Test. This test uses both eyes, allows for eye movements and is a more functional look at patient useful visual field. Quadrantanopia is loss of vision in a quadrant of the visual filed (upper right, lower right, upper left, lower left). It can also be homonymous (in both eyes) and may be described a superior right homonymous quadrantanopia. A central scotoma is is loss of the central visual field and is associated with age-related macular degeneration. Their are two common strategies behind improving functional status for patients with a field cut. We tend to use a combination of both at the optometry office. The most common technique is to improve scanning strategies by having the patient perform scanning tasks into the area of the field cut. This can be done with any number of devices such as a Dynavision or a Sanet Vision Integrator. Both of these devices, and others, present random targets in a field with the patients ability to find these targets being timed. With either of these, patient practice scanning strategies which improves their awareness of the field and improves their time locating targets in the missing field. In optometry, we have other tools available. We can use field expansion systems such as the Peli-lens or Gottlieb Field awareness system. Both of these involve the application of small pieces of prism to the lens of the patients glasses. 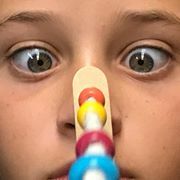 These small strips move visual stimuli into the patient’s existing field “reminding” them to look to the affect side. They cue the patient to scan into the missing field, something like a warning system. 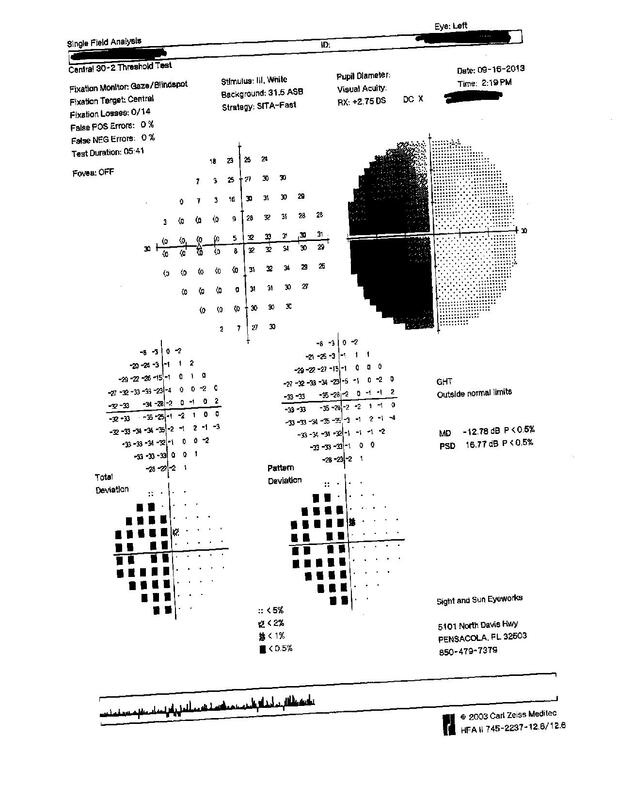 This entry was posted in occupational therapy, stroke, vision rehabilitation and tagged brain injury, eye movements, field cut, glasses, hemispatial neglect, learning disabilities, low vision, neurological rehabilitation, occupational therapy, optometry, read problems, saccades, stroke, vision rehabilitation, visual field. Bookmark the permalink.